Red Circuit surprised in 2006 with their debut Trance State garnering many generous reviews. Formed by Markus Teske, keyboardist and talented producer/sound engineer (Symphony X, Neal Morse, Ian Parry's Consortium Project, Saga and Vanden Plas), Red Circuit returns after a nearly four year hiatus with Homeland, another fine platter of power metal with progressive nuances. Of immediate attention is the fact that Teske and Red Circuit were able to keep talented vocalist Chitral 'Chity' Somapala in the fold. Sounding a bit more raw than usual, Sompala still defines the essential metal vocalist with moving performances on Fall in the Skies and Reach Out. Another noticeable nuance is the increased heaviness of many compositions. Without losing any melody, vocal harmonies, or ever present hooks, songs like Common Man in Disgrace, Absinth, or Through the Eyes of A Child are built upon strong charging riffs. With this characteristic, Homeland lends itself more to the power than progressive side of heavy metal. Yet, the listener can still hear a strong evidence of prog on Homeland, Spear of Fate, or Canonize Your Sins. Although there is little new ground broken here for power/progressive metal field, Red Circuit's Homeland remains a viable work in the genre thanks to the exceptional musicianship and strong song composition. Recommended! 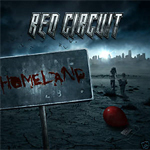 Although there is little new ground broken here for power/progressive metal field, Red Circuit's Homeland remains a viable work in the genre thanks to the exceptional musicianship and strong song composition.